Sitting in my living room at the end of a hectic day’s work, looking out over the rooftops of London, enjoying the blue sky and the tiny outline of the London Eye in the distance, I could finally put my feet up and relax. In that moment it hit me: I live in London!!! Admittedly one of my favorite cities. Moving to a city of this caliber has been more tiring than I initially thought. The amount of people out and about each day is fascinating, yet exhausting. Even on sundays the streets are bubbling with life (back home your lucky to find an open supermarket within 20 minutes). Some evenings you need a break from the buzz going on around you, a quick, tasty home made meal, a glass of wine and time to switch off your brain. These moments are rare. Enjoy them!! This recipe is the result of my most recent one. A quick note about the word salmon for all our swiss/german readers: the “l” is silent, no joke. Please engrave this newly won knowledge into your mind. Thank you. 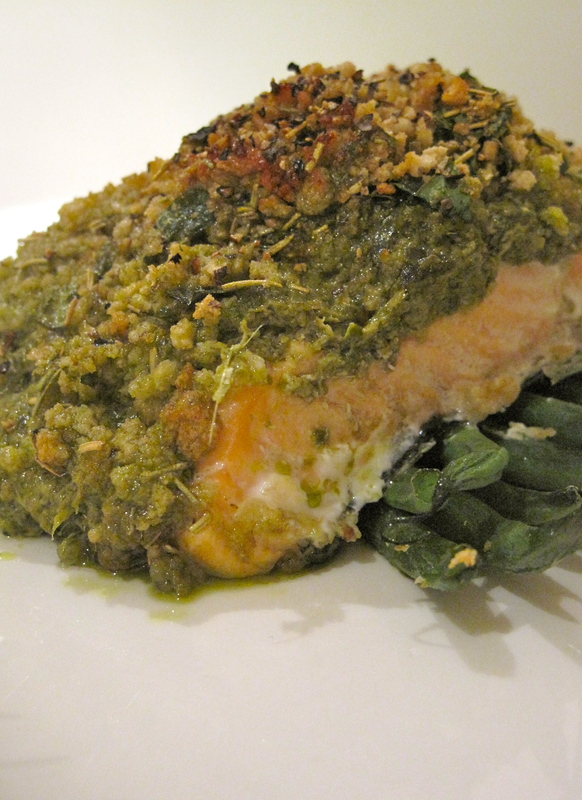 As for the recipe: it is a Jamie Oliver inspired simple salmon dish prepared within minutes. Perfect if you don’t want to invest a lot of time, but still feel like a satisfying your taste buds. Considering its based on one of Jamie’s recipes, I thought I’d stick to his art of cooking and go with my gut feeling regarding the amount of ingredients.